Bricks & Glass is a capital campaign to raise two million dollars for the first phase of the Ball & Socket Arts project. Phase 1 will restore the two wood-framed buildings along Willow Street, including parking, landscaping and exterior restoration of the buildings facing West Main Street (see site plan below). The wooden buildings will house two exhibition spaces, studio and co-work spaces and pioneer commercial tenants. Our goal for Phase 1 is to create a microcosm of the larger project to propel development of the rest of the site. Contributions of any size in support of Bricks & Glass are welcome and gratefully appreciated. For donors ready to make larger gifts, we offer pioneer naming opportunities to memorialize your gift. Sponsor a Window: for a gift of $1,500 or more you can put your name, or the name of someone you wish to honor or memorialize, one one of our beautiful windows. For more information, please click here. We have many rooms, galleries and buildings that may be suitable for memorializing a major gift. To discuss these opportunities, please contact us using the form at the bottom of this page. Thank you for supporting the project, and welcome to the Ball & Socket Arts family! 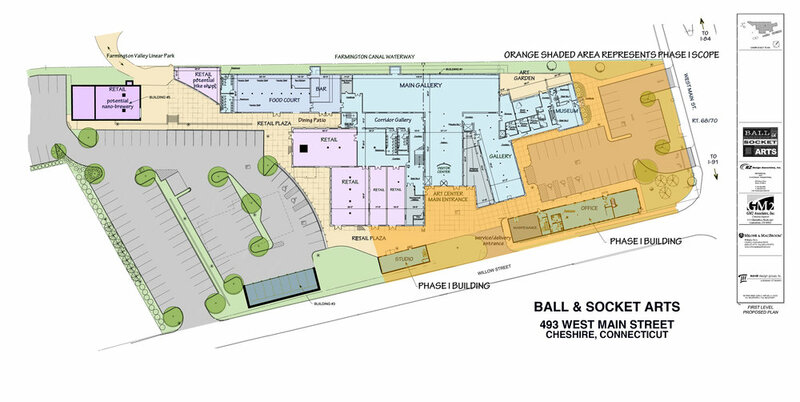 Site plan showing full site design with Phase I scope highlighted in orange. Please complete this form if you would like to be contacted concerning the Bricks & Glass Capital Campaign.